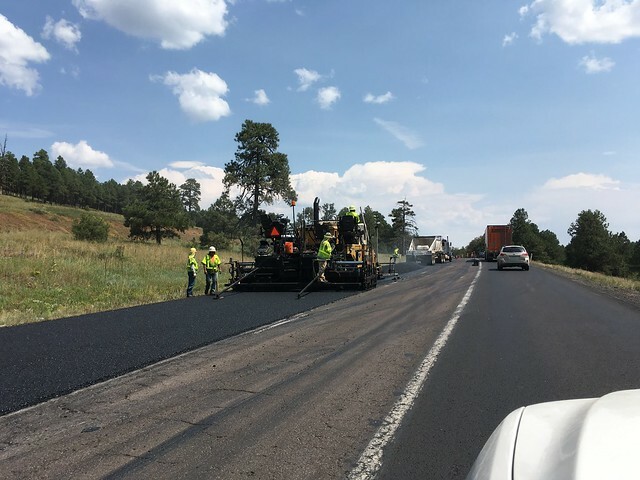 Take a look at a slideshow with crews repaving Interstate 40 west of Flagstaff between milepost 179 and 191. With the project more than halfway done, crews continue to move closer to Flagstaff laying a fresh layer of asphalt over older pavement damaged by yearly winter storms. Crews are on track to complete this project before the weather cools off. Drivers should budget extra travel time through the area. The project also includes new guardrails and minor bridge repairs. Next year, ADOT will pick up where this project left off at Parks and continue west for 17 miles toward Cataract Lake near Williams. Together these two projects, along with work occurring just west of William to reconstruction eastbound lanes of I-40, will repair damage done to the highway from winter storms and prolong the life of the road surface.